This is my very first "Blogging"! Hi everyone, after a long time of procrastinating I decided I wanted to make a blog about my art!! Wohooooo!!! Just to add alittle info about me, I'm a full-time self respresenting artist, that loves animals and bright colors!!! 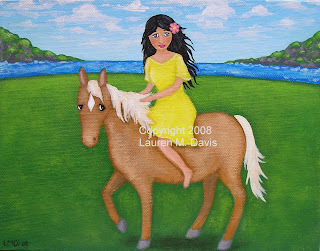 I've been selling my art on ebay since 2004 and currently my ebay username is Laurenmdavisart . I also sell on cafepress and etsy and do commission paintings. Attached is a photo of one of my newest paintings, I call it "Island Gal" and its up for bid on ebay at the moment. I had fun painting this one and I hope everyone likes it!!! :) lovely work and thanks for visiting me! 3 New Frisky Kitty 2.5 x 3.5 inch ATC/ACEO Art Cat Paintings On Ebay!!! Lauren M. Davis Folk Art! Hi I'm Lauren aka Aunt Squeezer a full-time self representing artist! I live in Pensacola Florida and have been selling my art online since 2004. I am a huge animal lover and have many beloved furbabies some furry, some scaled, some feathery. I try to show the Love and Joy I feel for animals through my art. My cat Sharky is often featured in my paintings and he wouldn't have it any other way!!! !